How to spot a real estate bubble? When the world starts getting on your nerves, a luxury haven is all it takes to relax your mind and unwind. Which is why gardens in Bahrain are the ideal place to unwind in an enclosed garden sanctuary. 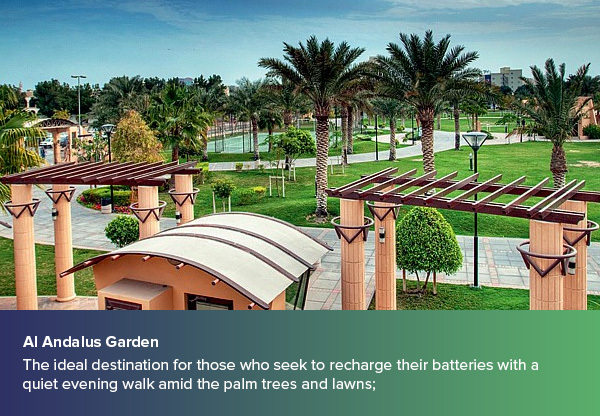 Gardens in Bahrain are a place for contemplation and relaxation where visitors from all corners of the globe come to enjoy their own garden escape. Suitable for all family members, gardens in Bahrain offer visitors and tourists a fun-filled vacation with friends and families. 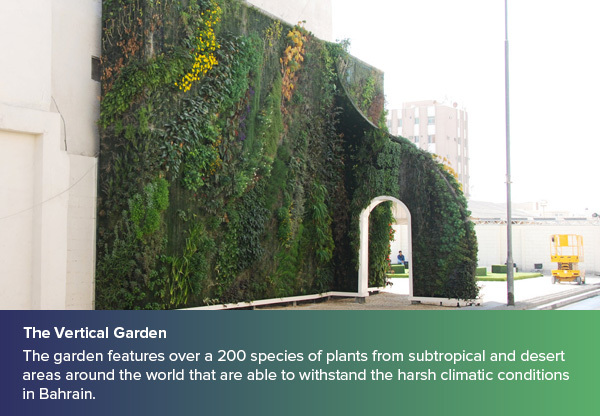 Recognized as the one of the Kingdom’s most innovative creations ever and the first outdoor vertical park in the Middle East, the vertical garden is located on the edge of Muharraq. The garden features over a 200 species of plants from subtropical and desert areas around the world that are able to withstand the harsh climatic conditions in Bahrain. This green gate at the entrance of Muharraq is your way to a whole new world inside where the pop of vibrant green is instantly eye-catching. Surrounded by nature’s beauty from all corners, the vertical garden in Bahrain is a sparse and stark-looking space with greenery that acts as a major tourist attraction. 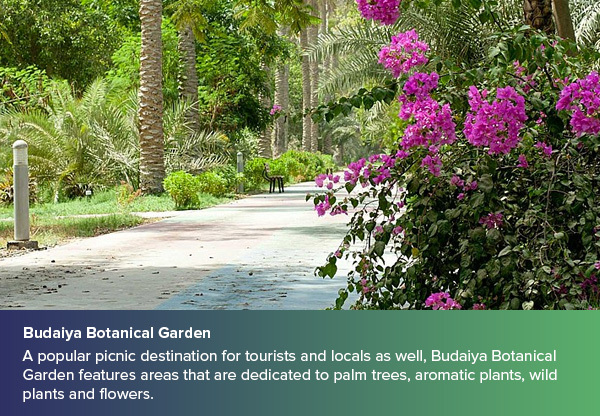 A popular picnic destination for tourists and locals as well, Budaiya Botanical Garden features areas that are dedicated to palm trees, aromatic plants, wild plants and flowers. That’s not all, for the garden is also the home to Bahrain’s annual outdoor farmers’ market that runs from April to December where the place is filled with food stalls with some of the most scrumptious dishes ever and dance shows by pop artists take place where visitors enjoy the haven of lush greenery amidst a mesmerizing theatrical ambience. Marina Garden Park is a nice place to relax, unwind and enjoy the beautiful and refreshing sceneries of nature. The park is also filled with spacious outdoor spaces where visitors can enjoy a wide array of fun activities. Above all this, the park also features a Dolphin park and many water rides that surely make for a fun-filled day with family and friends. With panoramic views of the sea, Marina Garden Park is the perfect combination of peace, greenery and adventurous activities. It is definitely one of the most favoured destinations to visitors from all corners of the globe. 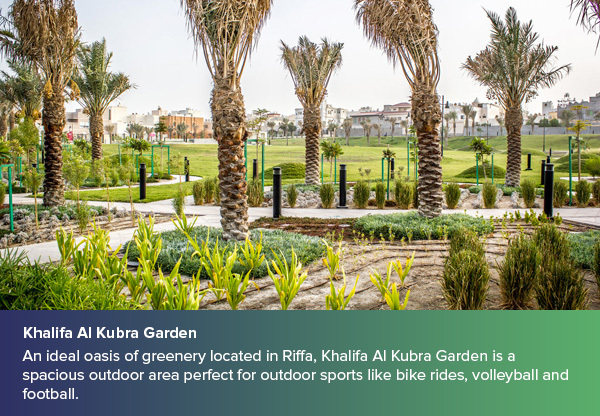 An ideal oasis of greenery located in Riffa, Khalifa Al Kubra Garden is a spacious outdoor area perfect for outdoor sports like bike rides, volleyball and football. With walking and running tracks right in the middle of green spaces, visitors will definitely enjoy a nice jog or a peaceful walk surrounded by one of the most relaxing and refreshing surroundings ever. The place is almost never too crowded which makes it the perfect spot for friends and family outings seeking to have an enjoyable and memorable time amidst a haven of tranquillity. The ideal destination for those who seek to recharge their batteries with a quiet evening walk amid the palm trees and lawns; Al Andalus Garden features plenty of shaded benches in the middle of the lush greenery where you can get an overdose of fresh air. Even though it needs a major facelift but the garden remains one of the popular destinations in Bahrain. Nothing beats a walk in the park on a sunny morning where you can witness families having an enjoyable time and strolling along relaxing or having a picnic. Occupying a total area of 43,000 square meters, Princess Sabeeka Park was officially opened in 2010 by Her Royal Highness Princess Sabeekabint Ibrahim Al Khalifa, wife of His Majesty King Hamad bin Isa Al Khalifa and Chairwoman of the Supreme Council for Women in Bahrain. 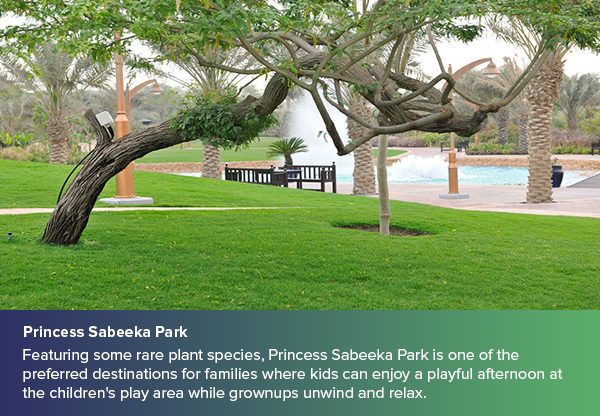 Featuring some rare plant species, Princess Sabeeka Park is one of the preferred destinations for families where kids can enjoy a playful afternoon at the children’s play area while grownups unwind and relax. The park is considered the perfect place for companies’ big events and celebration. The garden also houses Dar Al-Nakheel, a model scientific laboratory for renewable energy. 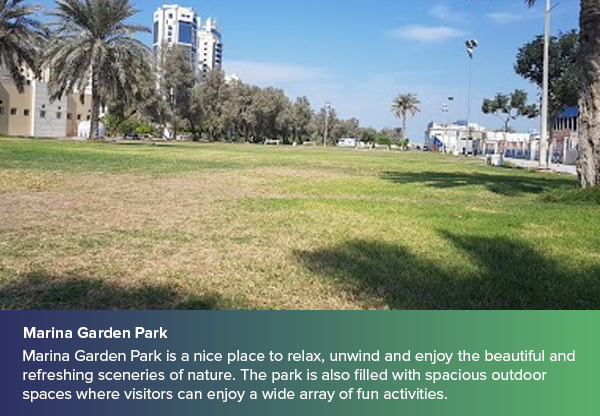 These are just some of the many beautiful green areas and gardens in Bahrain you can visit to enjoy some nature-infused tranquility and quality time.